We have shown PET imaging using labelled glucose identifies inflamed “at risk” plaques which are associated with increased stroke risk. This work is carried out in the WBIC PET facility. 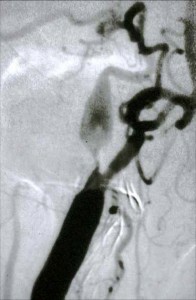 Asymptomatic circulating cerebral emboli can be detected using TCD. They appear as short duration high intensity signals. Our work has involved validating the technique and refining the technique, developing automated systems for embolic signal detection, and showing embolic signals predict stroke risk. In the multicentre international Asymptomatic Carotid Emboli Study (ACES) we showed the presence of embolic signals in patients with asymptomatic stenosis was highly predictive of future stroke risk. We have developed the use of TCD emboli detection as a technique to evaluate new antiplatelet regimens. Because asymptomatic emboli in patients with carotid disease are much more common than clinical stroke it is possible to evaluate treatments in much smaller patient numbers. We have shown the effectiveness of dual antiplatelet regimens (aspirin and clopidogrel) in both the CARESS and CLAIR studies, and also demonstrated the effectiveness of more novel antiplatelet agents including a von Willebrand factor inhibitor and a targeted nitric oxide donor.